Cost is £15 drop-in rate per class or £120 for 10 classes (can be Monday or Wednesday classes). All equipment is provided: mats, belts, blocks, blankets and eye bags. Classes run every week unless displayed otherwise, but kindly call 07957195618 or email before attending first class. 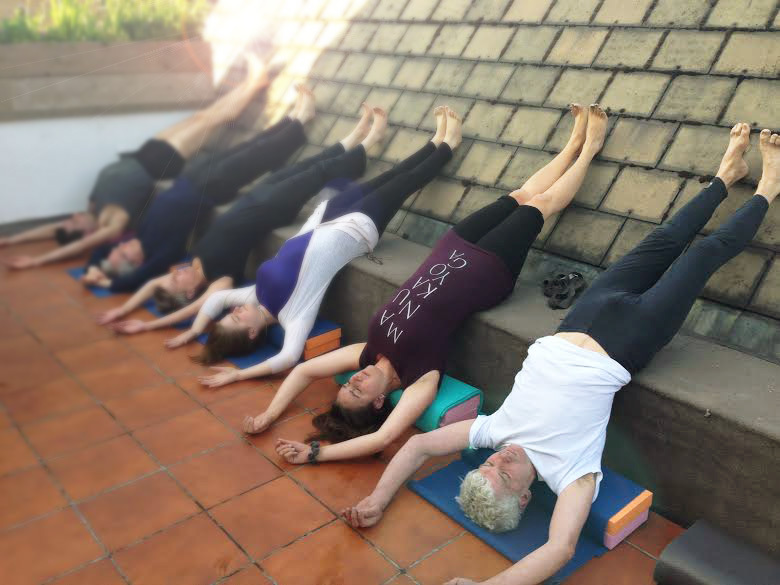 Wednesday class is suitable for students who have been attending Iyengar yoga classes regularly for at least two years and can maintain sarvangasana for 5 mins. Work is more intensive than at Beginners’ level and you will be introduced to a wider range of poses. It is much more powerful when we meditate in a group. So Ive decided to offer a free, open-house space to anyone of you who wish to come along to my Dalston Studio every Wednesday. Please arrive from 17.30 onwards, we meditate at 17.50. This will be a silent space in which you can meditate, do pranayama etc. I will be meditating too, so very sorry to say, but no latecomers please. Try to arrive before 17.45, we will start meditating at 17.50pm until 18.15. My Wednesday night Yoga group is at 18.30; people start arriving at 18.15. You are welcome to come just for the meditation, but you can also stay for the yoga too.